I picked up this book on the premise that the subheading “Creativity and Generosity in a Connected Age” would help me be more resourceful and productive. It resulted in a fascinating read that I found myself bringing up in conversation time and time again. I am not sure if I feel more productive now I have finished, but I feel as thought I understand a little bit better exactly why things they are a-changing. Shirky writes in an incredibly concise way, throwing in clear and enlightened insights consistently, not only explaining how and why, but leaving your thoughts reeling in the wake of what he has just said. 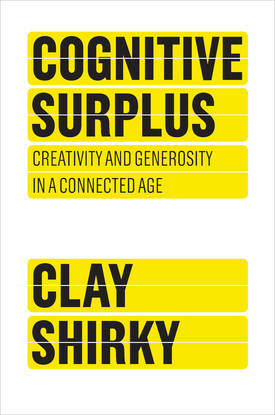 The story of Cognitive Surplus covers just what we do with our free time since the occurance of the big old world wide web. Previously us citizens were seen simply as passive consumers of television, singularly and separately in our spare time. With the revolutionary nature of the internet we saw a change in this consumption. People began reaching for the mouse, interacting, as pointed out by Shirky, through varied avenues such as Lolcatz or couchsurfing to the communities of open source technology programming. Shirky discusses how we use our free time and how it has changed due to the burst of social media over the past few years, now allowing interconnectivity on new levels. For me, I felt my eyes sparkle. What if it's true, and all of this free time can result in a better, more communal society? At the moment, in the UK and across Europe, and even the world, we are seeing financial crisis' left right and centre. Younger and older people alike are finding themselves jobless. Under 25 employment is at a record high in the UK. And all of these young people have grown up in the age of the internet, watching the technological revolution unfold. We have already seen the importance of social media in various uprisings across the world; from the revolution in Egypt to the formation of Occupy globally. The internet, and more specifically social media is becoming integral in organising human beings into value laden action. Perhaps now we will see a further politicisation of the younger generations; those sat at home, jobless, full of fury and promise, constantly reaching for the mouse to see what can be done.